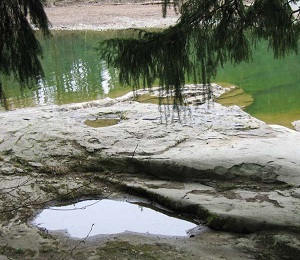 The Land Conservancy of Canada concluded the acquisition of this 56 hectare property in 2000 at which time the RDN entered into a long-term lease to manage the lands as regional park and conservation area. In 2016, the property was transferred to The Nature Trust of British Columbia. The Regional District of Nanaimo continues to manage the park under the 99-year lease. The park is one of the few remaining natural forests along the lower reaches of the Nanaimo River and a good example of mature coastal Douglasfir ecosystem. 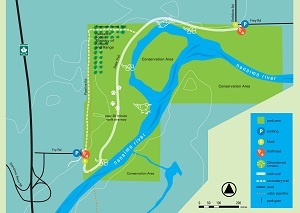 A developed trail network provides walkers, cyclists, swimmers and nature lovers with lots of room to recreate in the woods and along the river; the south eastern portions of the park are dedicated to wildlife habitat. 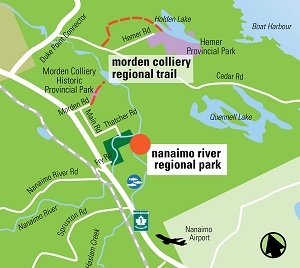 For additional information on the Nanaimo River Regional Park Management Plan, please Click Here.